Mix the honey and 5 spice together. Reserve to glaze the duck. Remove any sinew and excess fat from the duck breast. Season with Maldon sea salt. Add the duck breast to a cold frying pan skin side down and place on a medium heat. Cook for a round 6 minutes to render the fat. Drain away the duck fat as it melts. Once the skin side is crispy and golden brown turn over and cook for a further 3-4 minutes. Once the duck is cooked to the right degree allow it to rest for few minutes. Whilst resting brush the skin side with the honey and 5 spice glaze. Peel and slice the shallots and garlic. Discard any tough outer leaves from the cabbage, remove the core and cut the leaves into long strips. Place the butter into a pan with the bacon lardons over a medium heat and cook for around 5 minutes. Once the lardons begin to colour, add the chopped shallots and garlic, continue cooking for 2 more minutes, and then add the cabbage. Add a splash of water and cook for 5 minutes until the cabbage is tender. When cooked add the double cream and reduce by half. Check the seasoning and add salt and pepper if necessary. Place the creamed cabbage in a ring just off the centre on the plate. 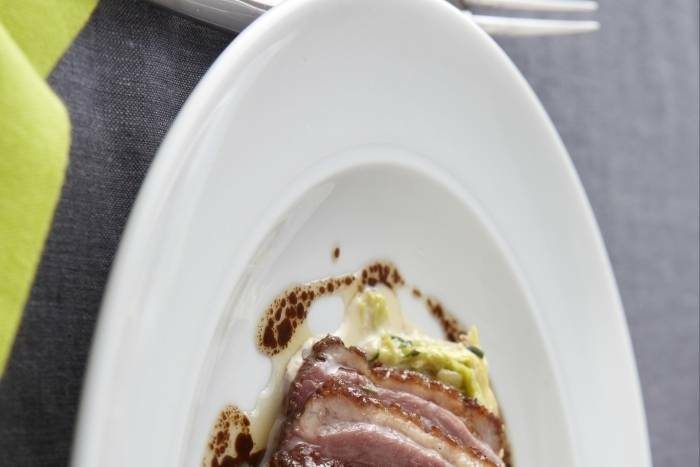 Thinly slice the duck breast lengthways and fan around the cabbage. Drizzle on the juices from the duck.